Havana Cathedral (The Cathedral of the Virgin Mary of the Immaculate Conception; Spanish: La Catedral de la Virgen María de la Concepción Inmaculada de La Habana) is one of eleven Roman Catholic cathedrals on the island of Cuba. It is located in the Plaza de la Catedral in the center of Old Havana. The thirty-four by thirty-five meter rectanglular church serves as the seat of the Roman Catholic Archdiocese of San Cristobal de la Habana. The church was built in the Baroque architectural style with several Tuscan elements, and is considered one of the best examples of Baroque architecture in Cuba. The building is mainly constructed from blocks of coral cut from sources in the Gulf of Mexico's ocean floor. Preserved marine fossils are present in the facade. The right bell tower is wider than the left. The larger tower contains two bells that were cast with gold and silver mixed into bronze which gives them an elegant and sweeter tone[clarification needed]. The cathedral is said[by whom?] to be the only example of a Baroque facade with such a distinctive asymmetrical feature. The asymmetrical bell towers allow for water that tends to accumulate on the plaza after a heavy rainfall to flow through the streets and out to the ocean. The plaza is located on the site of a swamp that was drained and used as a naval dockyard before the cathedral was built. The cathedral can be categorized as an early Cuban Baroque facade because of its many curves and double curves that turn into column-like pilaster structures on the facade, which are ornamental rather than structural. The use of pediments is another defining Baroque feature. Despite its grandiose exterior, the inside of the building is much more simple, even austere. The interior of the cathedral was extremely ornate until its "cleansing of excess ornamentation" in the 19th century. 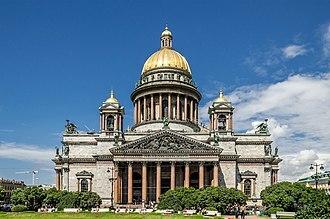 The cathedral's interior is in the neoclassical style, It has white and black marble floors, three naves covered with wooden vaults, massive stone pillars, and eight side chapels. As more and more of the indigenous people were converted to Catholicism, the need for churches grew quickly. One of the largest missionary groups on the island were priests of the relatively new Society of Jesus (Jesuits). Many requests for construction had been denied by Havana's fight Attorney General. After extensive petitioning and the purchase of a piece of land in the Plaza by Diego Evelino Hurtado de Compostela, Bishop of Santiago de Cuba, a permit was granted to these missionaries. The cathedral is set in the former Plaza de La Ciénaga. In 1727 plans to build a church, convent and collegium were approved and the project began to take form, even though the location was less than ideal. The Jesuits began construction of the cathedral in 1748 on the site of an earlier church and it was completed in 1777, well after King Carlos III expelled the Jesuits from the island in 1767. Legend has it that the cathedral once held remains of Christopher Columbus. In 1796, after the Peace of Basel was signed and Spain ceded most of Hispaniola to France, the remains of Columbus were moved and laid to rest in the cathedral's Altar of the Gospel. 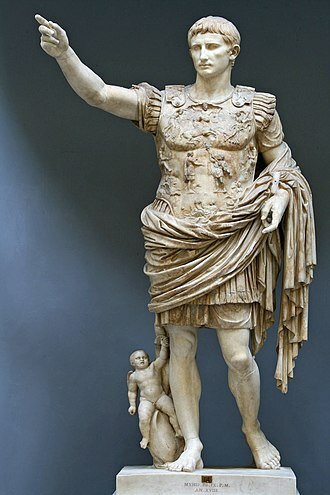 The gravestone read "Oh Remains and Image of Great Columbus, Be Preserved One Thousand Years in the Funerary Urn." The remains were returned to Spain in 1898 after the Cuban War of Independence. 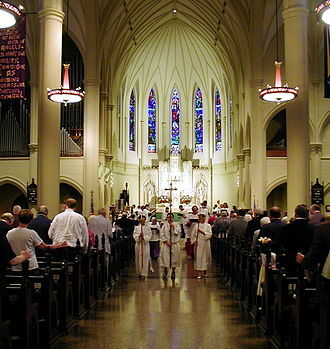 The cathedral was renovated between 1946 and 1949. 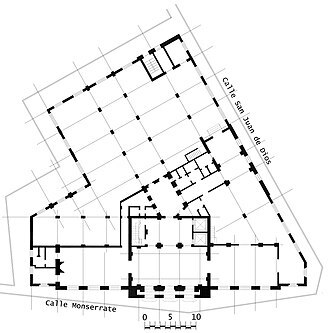 Cuban architect Cristobal Martinez Marquez headed the project and through complex architectural procedures gave the church interior a more open and grandiose space, allowed more light to enter, and improved its ventilation system. The cathedral contains a number of paintings and frescoes. 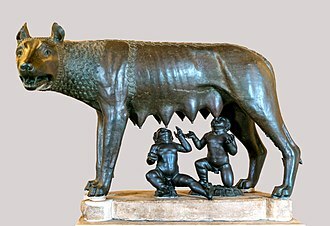 Most are copies of original works that can be found in cathedrals around Rome and various museums. The side chapels contain copies of paintings by Peter Paul Rubens and Bartolomé Esteban Murillo, both Baroque artists. Above the main and relatively austere altar are three fading frescoes by Italian artist Giuseppe Perovani, a neoclassical artist who was commissioned by Bishop Juan José Díaz de Espada y Fernánez de Landa to paint three scenes: The Delivery of the Keys, The Last Supper and The Ascension. A large statue of St. Christopher, The cathedral stands within the area of Old Havana that UNESCO designated a World Heritage Site in 1982. Wikimedia Commons has media related to Catedral de Havana. The tympanum, the triangular area within the pediment, is often decorated with relief sculpture. 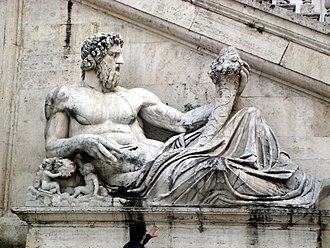 The pediment is found in classical Greek temples, renaissance, a prominent example is the Parthenon, where it contains a tympanum decorated with figures in relief sculpture. This architectural element was developed in the architecture of ancient Greece, in Ancient Rome, the Renaissance, and architectural revivals, the pediment was used as a non-structural element over windows and aedicules. A variant is the segmental or arch pediment, where the normal angular slopes of the cornice are replaced by one in the form of a segment of a circle, both traditional and segmental pediments have broken and open forms. In the broken pediment the raking cornice is left open at the apex, the open pediment is open along the base – often used in Georgian architecture. 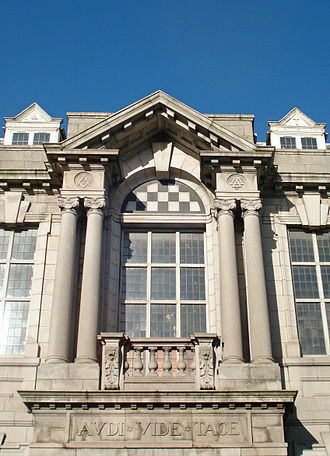 A further variant is the Swan-necked pediment, where the cornice is in the form of two S-shaped brackets. The decorations in the tympanum frequently extend through these openings, in the form of Alto-relievo sculpture, tondo paintings and these forms were adopted in Mannerist architecture, and applied to furniture designed by Thomas Chippendale. The Society of Jesus Latin, Societas Iesu, S. J. SJ or SI) is a religious congregation of the Catholic Church which originated in Spain. The society is engaged in evangelization and apostolic ministry in 112 nations on six continents, Jesuits work in education, intellectual research, and cultural pursuits. Jesuits give retreats, minister in hospitals and parishes, and promote social justice, Ignatius of Loyola founded the society after being wounded in battle and experiencing a religious conversion. 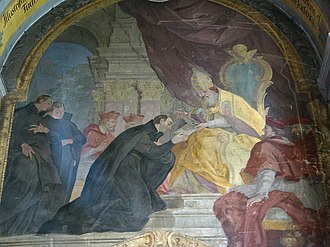 He composed the Spiritual Exercises to help others follow the teachings of Jesus Christ, ignatiuss plan of the orders organization was approved by Pope Paul III in 1540 by a bull containing the Formula of the Institute. Ignatius was a nobleman who had a background, and the members of the society were supposed to accept orders anywhere in the world. The Society participated in the Counter-Reformation and, later, in the implementation of the Second Vatican Council, the Society of Jesus is consecrated under the patronage of Madonna Della Strada, a title of the Blessed Virgin Mary, and it is led by a Superior General. The Society of Jesus on October 3,2016 announced that Superior General Adolfo Nicolás resignation was officially accepted, on October 14, the 36th General Congregation of the Society of Jesus elected Father Arturo Sosa as its thirty-first Superior General. 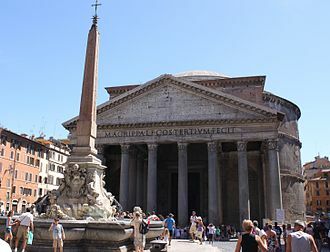 The headquarters of the society, its General Curia, is in Rome, the historic curia of St. Ignatius is now part of the Collegio del Gesù attached to the Church of the Gesù, the Jesuit Mother Church. In 2013, Jorge Mario Bergoglio became the first Jesuit Pope, the Jesuits today form the largest single religious order of priests and brothers in the Catholic Church. As of 1 January 2015, Jesuits numbered 16,740,11,986 clerics regular,2,733 scholastics,1,268 brothers and 753 novices. In 2012, Mark Raper S. J. wrote, Our numbers have been in decline for the last 40 years—from over 30,000 in the 1960s to fewer than 18,000 today. The steep declines in Europe and North America and consistent decline in Latin America have not been offset by the significant increase in South Asia, the Society is divided into 83 Provinces with six Independent Regions and ten Dependent Regions. The Peace of Basel of 1795 consists of three peace treaties involving France during the French Revolution. With great diplomatic cunning, the treaties enabled France to placate and divide its enemies of the First Coalition, Revolutionary France emerged as a major European power. The first treaty, on 5 April 1795 between France and Prussia, had been discussion since 1794. Prussia withdrew from the coalition that had been working on the partition of Poland and. In secret, Prussia recognized French control of the west bank of the Rhine, France returned all of the lands east of the Rhine captured during the war. On the night of 6 April, the document was signed by the representatives of France and Prussia, François de Barthélemy and they were not face to face, each was in his own accommodation in Rosshof or the Markgräflerhof, and the papers were passed around by a courier. Peter Ochs drew up the Treaty and served as a mediator for a significant proportion of these financial statements, Prussia stuck to the agreement of the Treaty of Basel until 1806, when it joined the Fourth Coalition. Corals are marine invertebrates in the class Anthozoa of phylum Cnidaria. They typically live in colonies of many identical individual polyps. The group includes the important reef builders that inhabit tropical oceans, a coral group is a colony of myriad genetically identical polyps. 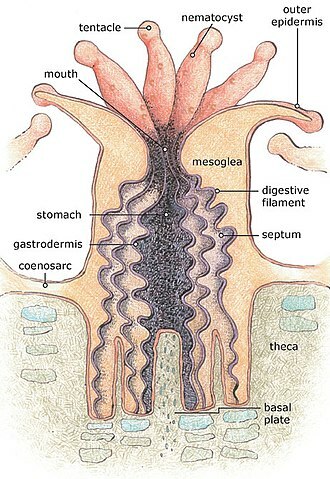 Each polyp is an animal typically only a few millimeters in diameter. A set of tentacles surround a central mouth opening, an exoskeleton is excreted near the base. Over many generations, the colony creates a large skeleton that is characteristic of the species. 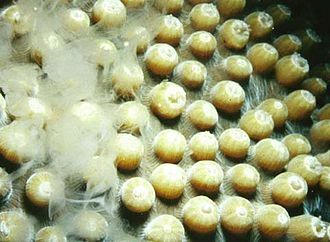 Individual heads grow by reproduction of polyps. Corals breed sexually by spawning, polyps of the same species release gametes simultaneously over a period of one to several nights around a full moon and these are commonly known as zooxanthellae and the corals that contain them are zooxanthellate corals. Such corals require sunlight and grow in clear, shallow water, other corals do not rely on zooxanthellae and can live in much deeper water, with the cold-water genus Lophelia surviving as deep as 3,000 metres. 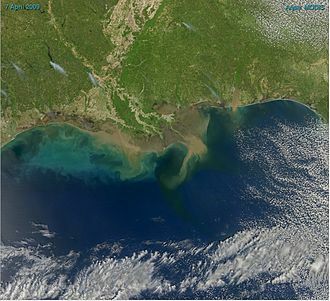 Some have been found on the Darwin Mounds, north-west of Cape Wrath, Corals have been found as far north as off the coast of Washington State and the Aleutian Islands. In his Scala Naturae, Aristotle classified corals as zoophyta, animals that had characteristics of plants and were therefore hypothetically in between animals and plants, the Persian polymath Al-Biruni classified sponges and corals as animals, arguing that they respond to touch. The phylogeny of Anthozoans is not clearly understood and a number of different models have been proposed, within the Hexacorallia, the sea anemones, coral anemones and stony corals may constitute a monophyletic grouping united by their eight-fold symmetry and cnidocyte trait. 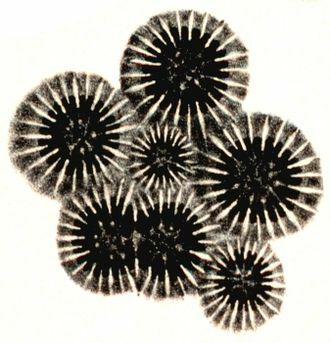 The Octocorallia appears to be monophyletic, and primitive members of this group may have been stolonate, the cladogram presented here comes from a 2014 study by Stampar et al. which was based on the divergence of mitochondrial DNA within the group and on nuclear markers. Corals are classified in the class Anthozoa of the phylum Cnidaria and they are divided into three subclasses, Hexacorallia and Ceriantharia. 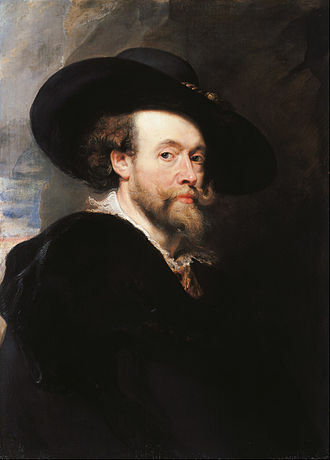 Sir Peter Paul Rubens was a Flemish/Netherlandish draughtsman and painter. He is widely considered as the most notable artist of Flemish Baroque art school, the catalogue of his works by Michael Jaffé lists 1,403 pieces, excluding numerous copies made in his workshop. His commissioned works were mostly history paintings, which included religious and mythological subjects and he painted portraits, especially of friends, and self-portraits, and in life painted several landscapes. Rubens designed tapestries and prints, as well as his own house and he oversaw the ephemeral decorations of the royal entry into Antwerp by the Cardinal-Infante Ferdinand in 1635. 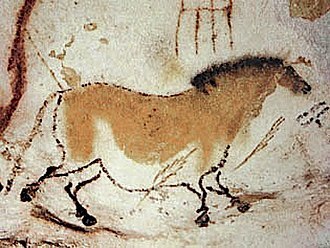 His drawings are mostly extremely forceful but not overly detailed and he made great use of oil sketches as preparatory studies. For altarpieces he painted on slate to reduce reflection problems. Rubens was born in the city of Siegen to Jan Rubens and he was named in honour of Saint-Peter and Paul, because he was born on their solemnety. 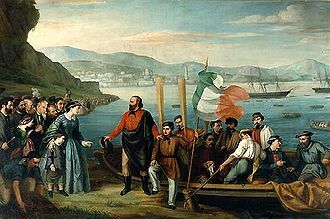 His father, a Calvinist, and mother fled Antwerp for Cologne in 1568, after increased religious turmoil and persecution of Protestants during the rule of the Spanish Netherlands by the Duke of Alba. Jan Rubens became the adviser of Anna of Saxony, the second wife of William I of Orange. Following Jan Rubens imprisonment for the affair, Peter Paul Rubens was born in 1577, the family returned to Cologne the next year. In 1589, two years after his fathers death, Rubens moved with his mother Maria Pypelincks to Antwerp, religion figured prominently in much of his work and Rubens became one of the leading voices of the Catholic Counter-Reformation style of painting. In Antwerp, Rubens received a Renaissance humanist education, studying Latin, by fourteen he began his artistic apprenticeship with Tobias Verhaeght. Subsequently, he studied under two of the leading painters of the time, the late Mannerist artists Adam van Noort. Much of his earliest training involved copying earlier works, such as woodcuts by Hans Holbein the Younger. Rubens completed his education in 1598, at time he entered the Guild of St. Luke as an independent master. In 1600 Rubens travelled to Italy and he stopped first in Venice, where he saw paintings by Titian and Tintoretto, before settling in Mantua at the court of Duke Vincenzo I Gonzaga. Old Havana is the city-center and one of the 15 municipalities forming Havana, Cuba. It has the second highest population density in the city and contains the core of the city of Havana. The positions of the original Havana city walls are the boundaries of Old Havana. Old Havana is a UNESCO World Heritage Site, Havana Vieja was founded by the Spanish in 1519 in the natural harbor of the Bay of Havana. It became a point for the treasure laden Spanish Galleons on the crossing between the New World and the Old World. In the 17th century it was one of the shipbuilding centers. The city was built in baroque and neoclassic style, many buildings have fallen in ruin in the half of the 20th century, but a number are being restored. The narrow streets of Old Havana contain many buildings, accounting for perhaps as many as one-third of the approximately 3,000 buildings found in Old Havana and it is the ancient city formed from the port, the official center and the Plaza de Armas. In 1555 Old Havana was destroyed and burned by the French corsair Jacques de Sores, the pirate had taken Havana easily, plundering the city and burning much of it to the ground. 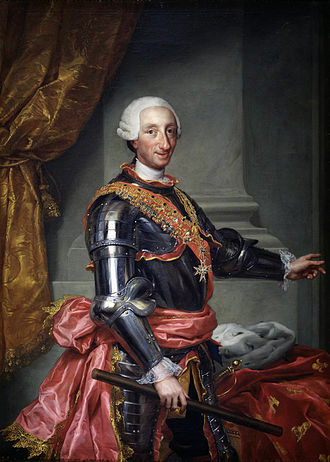 After limiting the scarce defenders, De Sores left without obtaining the wealth that he was hoping to find in Havana. 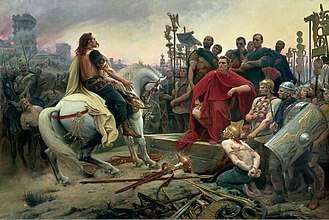 The city remained devastated and set on fire, since the incident, the Spanish brought soldiers and started building fortresses and walls to protect the city. Castillo de la Real Fuerza was the first fortress built, initiated in 1558, Old Havana resembles Cadiz and Tenerife. Alejo Carpentier called it de las columnas, but it could be named for the gateways, the revoco, the deterioration and the rescue, the intimacy, the shade, the cool, the courtyards. In her there are all the big ancient monuments, the forts, the convents and churches, the palaces, the alleys, the arcade, the human density. 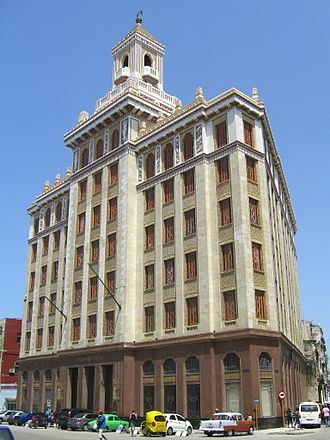 The Cuban State has undertaken efforts to preserve and to restore Old Havana through the efforts of the Office of the Historian of the City. The Malecón is the avenue runs along the seawall at the northern shore of Havana. The Paseo del Prado, Havana is the street forms the western edge of Old Havana. Cuba, officially the Republic of Cuba, is a country comprising the island of Cuba as well as Isla de la Juventud and several minor archipelagos. Cuba is located in the northern Caribbean where the Caribbean Sea, the Gulf of Mexico, and it is south of both the U. S. state of Florida and the Bahamas, west of Haiti, and north of Jamaica. Havana is the largest city and capital, other cities include Santiago de Cuba. Cuba is the largest island in the Caribbean, with an area of 109,884 square kilometres, prior to Spanish colonization in the late 15th century, Cuba was inhabited by Amerindian tribes. It remained a colony of Spain until the Spanish–American War of 1898, as a fragile republic, Cuba attempted to strengthen its democratic system, but mounting political radicalization and social strife culminated in the dictatorship of Fulgencio Batista in 1952. Further unrest and instability led to Batistas ousting in January 1959 by the July 26 Movement, since 1965, the state has been governed by the Communist Party of Cuba. A point of contention during the Cold War between the Soviet Union and the United States, a nuclear war broke out during the Cuban Missile Crisis of 1962. Culturally, Cuba is considered part of Latin America, Cuba is a Marxist–Leninist one-party republic, where the role of the vanguard Communist Party is enshrined in the Constitution. Independent observers have accused the Cuban government of human rights abuses. It is one of the worlds last planned economies and its economy is dominated by the exports of sugar, coffee, according to the Human Development Index, Cuba is described as a country with high human development and is ranked the eighth highest in North America. It ranks highly in some metrics of national performance, including health care, the name Cuba comes from the Taíno language. The exact meaning of the name is unclear but it may be translated either as where fertile land is abundant, authors who believe that Christopher Columbus was Portuguese state that Cuba was named by Columbus for the town of Cuba in the district of Beja in Portugal. Santiago de Cuba is the second largest city of Cuba and capital city of Santiago de Cuba Province in the south-eastern area of the island, some 870 km south-east of the Cuban capital of Havana. Historically Santiago de Cuba has long been the second most important city on the island after Havana and it is on a bay connected to the Caribbean Sea and is an important sea port. In 2004 the city of Santiago de Cuba had a population of about 509,143 people, Santiago de Cuba was the fifth village founded by Spanish conquistador Diego Velázquez de Cuéllar on July 25,1515. In 1516 the settlement was destroyed by fire, and was immediately rebuilt and this was the starting point of the expeditions led by Juan de Grijalba and Hernán Cortés to the coasts of Mexico in 1518, and in 1538 by Hernando de Sotos expedition to Florida. The first cathedral was built in the city in 1528, from 1522 until 1589 Santiago was the capital of the Spanish colony of Cuba. The city was plundered by French forces in 1553, and by British forces under Christopher Myngs in 1662, the city experienced an influx of French and British immigrants in the late 18th and early 19th centuries, many coming from Haiti after the Haitian slave revolt of 1791. This added to the citys cultural mix, already rich with Spanish. 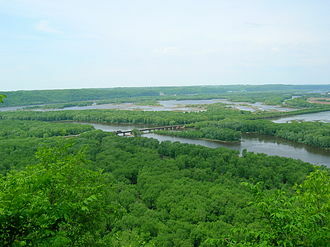 It was the location where Spanish troops faced their main defeat at San Juan Hill on July 1,1898, after capturing the surrounding hills, General William Rufus Shafter laid siege to the city. 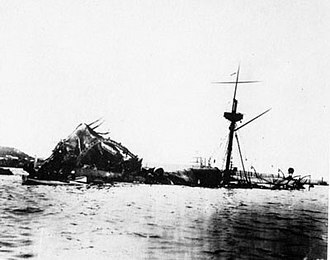 Spain surrendered to the United States after Admiral William T. Sampson destroyed the Spanish Atlantic fleet just outside Santiagos harbor on July 3,1898, Cuban poet and national hero, José Martí, is buried in Cementerio Santa Efigenia. Pope Francis visited Cuba in 2015, Santiago was the home of the revolutionary hero, Frank País. On July 26,1953, the Cuban Revolution began with an armed attack on the Moncada Barracks by a small contingent of rebels led by Fidel Castro. Shortly after this incident, País began talking with students and young working people informally. This developed into highly organized cells coordinating a large scale urban resistance that became instrumental in the success of the Cuban Revolution, País group prepared carefully, accruing weapons, collecting money, collecting medical supplies. The Romanesque nave of the abbey church of Saint-Georges-de-Boscherville, Normandy, France, has a triforium passage above the aisle vaulting. 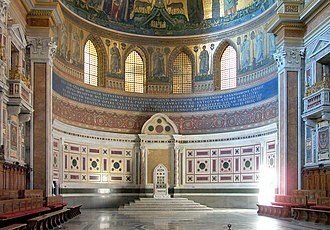 A fresco showing Old St Peter's Basilica, built in the 4th century: the central area, illuminated by high windows, is flanked by aisles. In a pitched-brick vault the bricks lean (are pitched) against an existing wall. Pointed barrel vault showing direction of lateral forces. An estimated 200,000 Cubans died of starvation and disease. 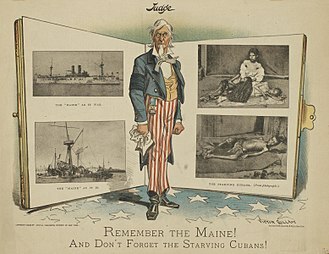 American cartoon, published in 1898: "Remember the Maine! And Don't Forget the Starving Cubans!" 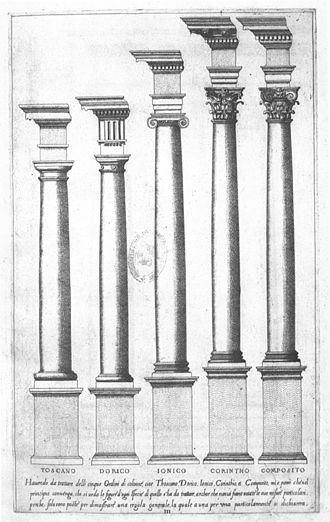 The five orders, engraving from Vignola's Regola delli cinque ordini d'architettura, 1562; Tuscan on the left. St Paul's, Covent Garden by Inigo Jones (1633), "the handsomest barn in England"